How do socio-cultural factors impact on the adoption rate of good farming practices and uptake of new technologies in the cocoa, coffee and oil palm sectors in PNG? 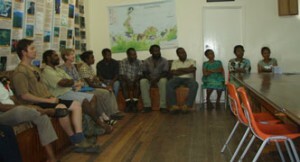 To learn more about incorporating social science research techniques into Australian Centre for International Agricultural Research (ACIAR) funded research projects (see Commercial/smallholder partnerships, PNG and Coffee Systems, PNG), the Crawford Fund sponsored 11 junior and middle-level research staff from the PNG Oil Palm Research Association (PNGOPRA), the Cocoa and Coconut Institute (CCI), and the Coffee Industry Corporation (CIC) to attend a three-day training course hosted by PNGOPRA in West New Britain Province. Curtin University researchers, Gina Koczberski, George Curry and Sean Ryan provided training on social science research design, qualitative and quantitative data collection techniques, analysis and interpretation, ethics – as well as designing and managing data bases. The training emphasised farmer-oriented approaches which value spending time with famers and their families, involving agricultural extension officers in the research design and data collection and encouraging a more ‘bottom-up’ methodology. 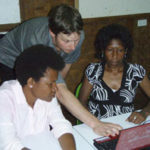 Whilst most participants were involved in collecting socio-economic data associated with ACIAR projects, many were not familiar with the main types of social science methods, especially the collection, coding and analysis of qualitative data, and how to effectively combine qualitative and quantitative techniques. Feedback from participants indicated they gained a greater appreciation of what socio-economics research entails and feel better equipped to incorporate social science techniques and procedures into socio-economic research projects.